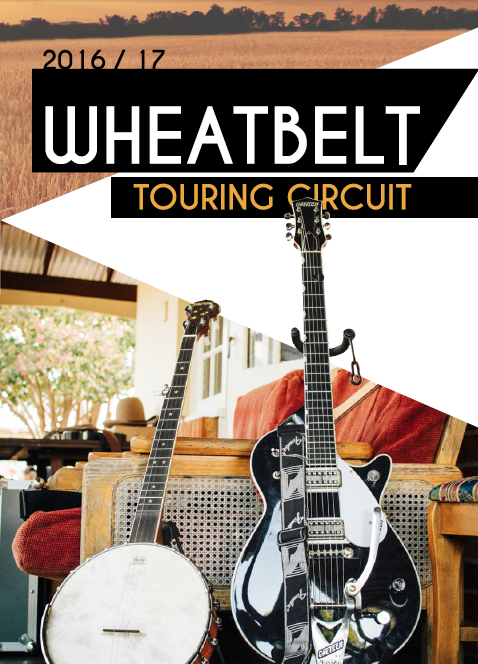 In partnership with RAC, and with support from the Department of Culture and the Arts, Royalties For Regions and Country Arts WA, WAM’s 2016 Wheatbelt Touring Circuit has expanded to include a huge four shows for this coming week’s tour, including a massive Dowerin GWN7 Machinery Field Days Sundowner show to kick it all off this coming Wednesday 24 August, the night ready to impress with five acts, Wheatbelt WAMbassadors and free entry! Headlined by WA Country Music Awards winner and multi-WAMi nominee Davey Craddock & The Spectacles, just before he heads on tour including AmericanaFest in Nashville, Dashville Skyline Festival in the Hunter Valley and more, Craddock and his all-star band will be performing on all dates with WAM SOTY-nominated, respected country/rock/roots artist Belle Harvey. 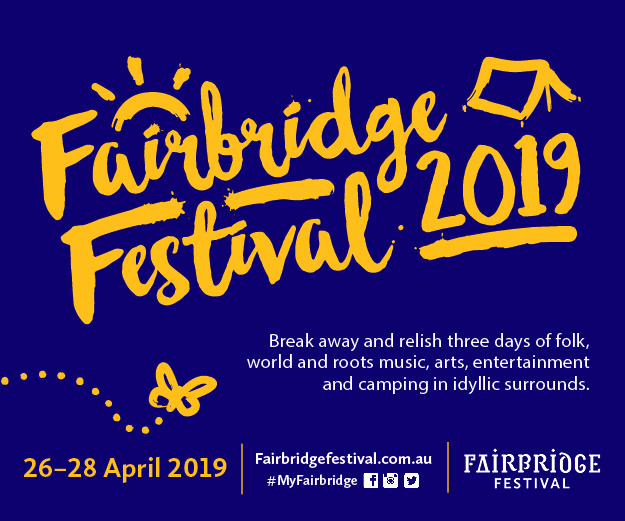 Across the venues, Wheatbelt acts supporting the headliners will include The Primary Collective featuring WAMbassador Jayden Crook, The Wildlings, Gauge Harder, Hayden McGlinn, WAMbassador Pete Byfield, WAMbassador Hayden Sprigg and a guest artist from the Narrogin Musicians Association (TBA). Tour 2 will roll into Dowerin on Wednesday 24 August as part of the Dowerin GWN7 Machinery Field Days Sundowner at the Dowerin Community Club; on Friday 26 at Bruce Rock District Club; Saturday 27 at the Corrigin Hotel; and finishing Sunday 28 August at the Quindanning Inne. And if you’re heading to Dowerin Field Days, the biggest annual event in the Wheatbelt, make sure you come expecting great music. WAM’s programming 15 talented Wheatbelt artists as part of the Wheatbelt Songwriters Showcase, popping up from 9am-4.30pm in nine different locations. 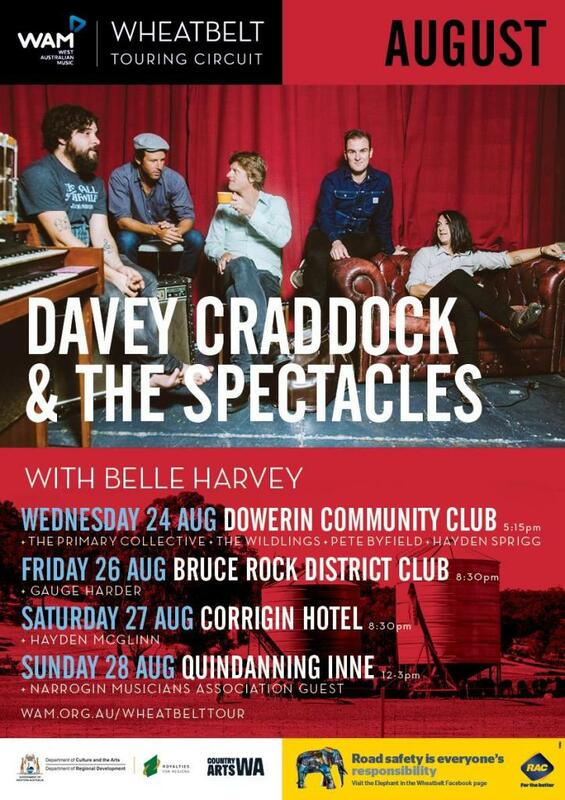 DAVEY CRADDOCK & THE SPECTACLES: This year has seen their album City West released, with the singles Better Alone and Girls Light Fires added to rotation on Double J and ABC Radio. 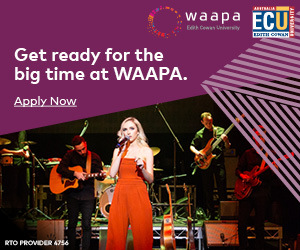 In the last year they’ve also been on three national tours, been nominated for WAMi and WAM Song of the Year awards and received critical acclaim from the alt-country, Americana, indie and folk loving media (and fans!). 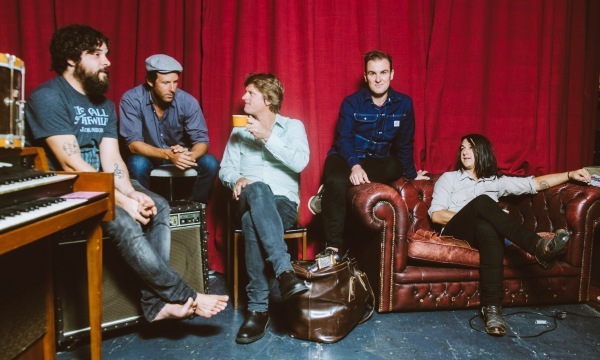 ‘The Spectacles’ captivating live shows have seen them supporting the likes of Old Crow Medicine Show, Don Walker, Diana Krall, Marlon Williams, The Waifs and The Basics, as well as appearances at West Coast Blues n Roots, Fairbridge, Nannup, Mt Beauty and Wave Rock festivals. BELLE HARVEY: Roots, country and rock’n’roll musician Belle Harvey originally hails from Albany. Now located in Perth, Belle has opened for acts including The Waifs, John Butler Trio and Claire Bowditch. Belle Harvey’s music is often linked to Lucinda Williams and Keith Urban. In 2006 Belle was nominated for WAM Song Of The Year with her track All These Lovers, as well as winning the Denmark Music Foundation Bursary competition. Belle’s energy and passion connects instantly to the soul, engaging folks with her infectious vibe. THE PRIMARY COLLECTIVE (feat JAYDEN CROOK): Jayden has played at the Guilford Heritage Festival, at venues throughout the Wheatbelt and opened for country musician Adam Brand. All the while, Jayden was quietly writing his own music, which he was encouraged to share through WAM’s regional programs. He now also leads The Primary Collective. 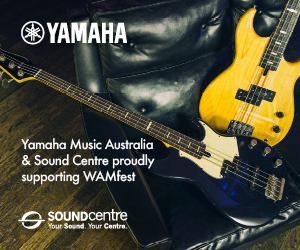 Jayden is passionate about live gigs and the work WAM is doing to develop regional music scenes, meaning he jumped at the opportunity to become a WAMbassador. PETE BYFIELD: Alternative country musician Pete Byfield has lived in the Wheatbelt for most of his life, with much of his music being inspired by the region. Pete’s song Wialki featured on the 2014 WAM Sounds Of The Wheatbelt album, and in 2015 Pete released his first album, One, which took home the 2016 WA Country Music Awards ‘Album of the Year’. His song Ashes received a nomination for WAM Song Of The Year in 2016. Choosing to become a WAMbassador was a logical flow on from Pete’s involvement with RAC and the ‘It’s My Elephant’ campaign. He has lost a number of very close friends in road crashes over the years. Alcohol, speed and inexperience were factors. NARROGIN MUSICIANS ASSOCIATION: With a rich heritage, NMA are an organisation interested in the promotion of music in the Narrogin area, including acting as the Big Bash Committee and organising events such as jam sessions, trivia nights and transport to concerts. This tour will feature another special guest from the group at the Quindanning Inne show.